An Adjustment is a document done at a Remote station that is used to make positive or negative modifications to the stock levels of items in inventory. merhandise to a vendor and Adjustments do not average costs in the Cost Audit Log). 3) To adjust stock levesl because of theft, damage to merchandise, lost merchandise or other shrinkage. 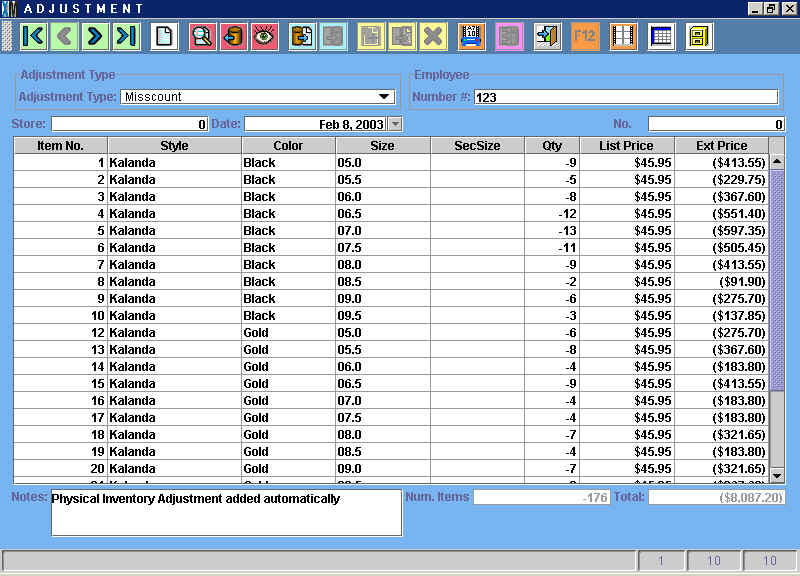 Adjustments are also generated automatically after Count Sheets are applied during the Physical Inventory. Every modification to inventory arising from a difference between the stock levels in the system and the stock levels physical counted are recorded in an Adjustment. * Average costs are in no way modified. Adjustements are synchronized out to the Main station just like any other document. This way the Main will up date its stock quantity information for the store in question. Once in the Adjustments screen, you will notice it looks like any other transaction screen with the same toolbar at the top. Before you begin, select the Adjustment type from the drop down menu. The contents of this menu are defined in the Adjustment Types Catalog at the Main station. You will want to make one of these options "Set Initial Inventory" for when you use Adjustments to set your initial inventory. Adjustment Types will help you keep track of the reasons behind different Adjustments and see, for example, the number of adjustments made because of theft vs those made because of misscounts. Once you have selected the adjustment type, enter the items that need to be adjusted. As with any transaction, you can enter the items that you want to adjust by entering the item number, scanning the bar code, looking up the item in the Item Catalog or by downloading the items from a PDT. In the example below, two additional stock quantities are being addeed to Item #67 and three stock quantities are being subtracted from Item #305. This particular adjustment was created automatically during a Physical Inventory. The text "Physical Inventory Adjustment added automatically" will appear in the Notes field of any Adjustment created during this process. 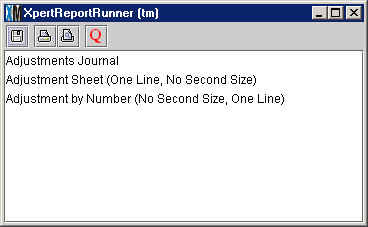 If you need to dig deeper, you can use the Adjustment by Number report to print the detail of a specific Adjustment.